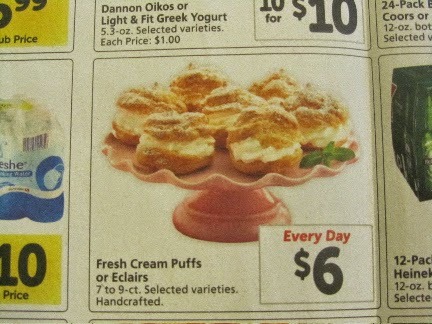 This week, the grocery ads for Mother's Day are featuring cream puffs and eclairs for $6 for a 7 to 9-count package. They are so easy to make (really!! ), and crazy-cheap. total to make my own cream puffs -- 95 cents. Even if your grocery costs are double mine, it would still be under $2 to make a batch of 12 to 15 cream puffs. My filling (whipped cream and fruit -- remember the whipped cream I bought on markdown, whipped, then froze back in February?) will cost about 50 cents for the whole batch. So for me, my price per cream puff will be about 10 cents per filled puff. 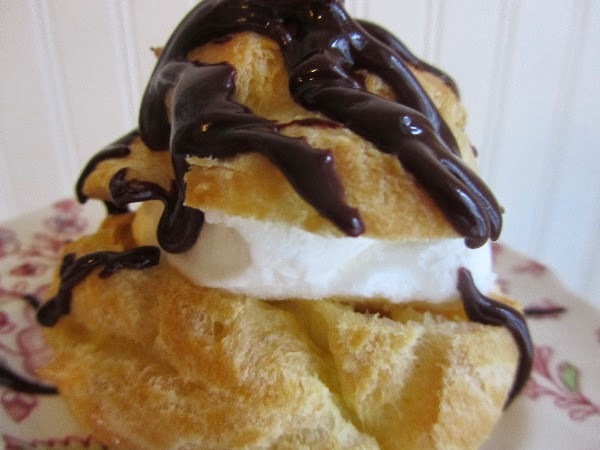 The grocery store cream puffs work out to almost $1 per cream puff! So you're thinking, "what do I need 15 cream puffs for?" Well, unfilled cream puffs freeze beautifully. You can use however many at a time that you need. And since the batter to make them is not at all sweet, you can use them to hold savory as well as sweet fillings. 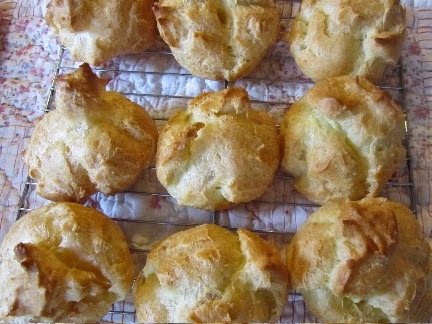 I sometimes make tiny cream puffs (referred to as cocktail-size) to fill with chicken salad, to take to potlucks. Cream puffs are egg-risen. Once they puff up, they have a hollowed out spot inside, just right for a dollop of filling. For a dessert, I pull frozen, unfilled cream puffs out from the freezer, allow to come to room temperature for 20 minutes, on the counter, then fill with either sweetened whipped cream, ice cream, or homemade vanilla pudding. You can frost the tops, sprinkle with powdered (confectioner's) sugar, or drizzle with a chocolate glaze or syrup. What's the best, though, is if these are for guests, they look so spectacular everyone thinks I'm some sort of master baker! I bake the cream puffs, in advance, so I'm not rushed at the last minute. (I baked the Mother's Day brunch ones on the Thursday before Mother's Day, then froze unfilled.) If more than a day in advance, I pop them into a ziploc and freeze them. Here's the recipe I've been using for the last 30 years, and that my mother used for 20 years before that. Place rack in center of oven. Preheat oven to 450 degrees F (non-convection). Grease the baking sheet. In the saucepan, bring the water to a boil. 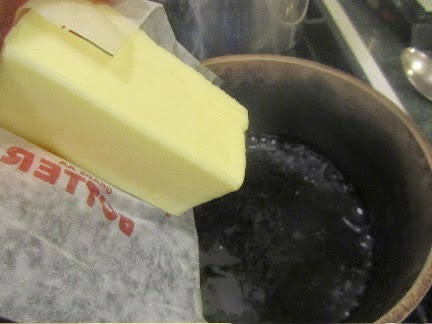 Add butter, and stir until butter is melted. Stir in salt. Add the flour, all at once, and stir vigorously until throughly mixed in, and a large mass develops. 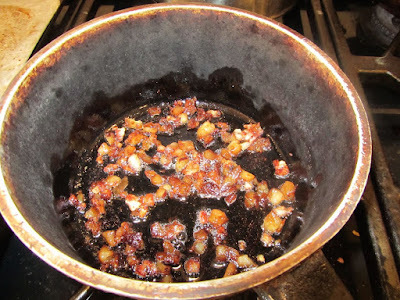 Remove pan from heat. In small bowl, beat 1 egg with fork. 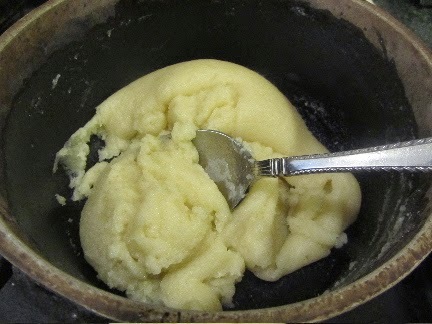 Add to this slightly cooled flour/butter/water mixture, and beat vigorously. 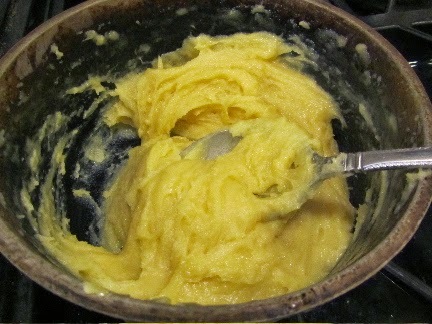 When thoroughly combined, break 2nd egg into small bowl, beat with fork, then beat into the flour/butter/water mixture. By now, the mixture is cool enough, that you can add the last 2 eggs, one at a time, beating well in between, whole, and not need to beat the eggs in a bowl first So, add the last 2 eggs, one at a time, and beat vigorously until thoroughly combined. You'll have to beat hard for about a minute or so. With the large spoon and a rubber spatula, spoon the batter onto greased baking sheet. The dollops will be about the size of a ping pong ball, before they naturally flatten. 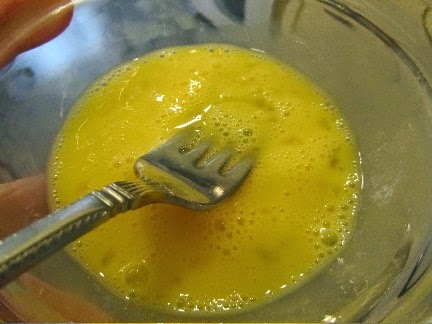 If desired, you can flatten the "points" with the back of a spoon, dipped in water. It's not necessary, but does make them more professional-looking. 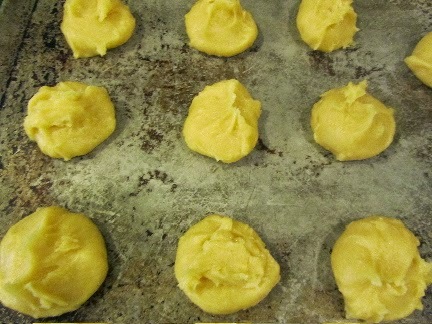 Bake the cream puffs at 450 F, for 14 minutes. Reduce heat to 325 degrees F, and bake for about 20-22 additional minutes, until golden. Allow to sit on baking sheet for about 1 minute, then remove to a cooling rack. Cool throughly. Just before serving, use a serrated knife to cut 1/3 off of the top, leaving a large hollow inside. Fill with sweetened, whipped cream, ice cream, cornstarch pudding or meat/egg-based salad. For the dessert cream puffs, you can also add a few slices of strawberries or a few blueberries, after the whipped cream. Replace the tops. Once filled, sprinkle with powdered (confectioner's) sugar, drizzle with chocolate glaze or syrup, or ice with a thin frosting. These freeze beautifully. Once cooled, slide into a large ziploc, whole and uncut, and store in freezer up to 4 months. As far as calories go (I really am trying to cut back on extra calories, I know, hard to believe when you see me posting about cream puffs), these are only as naughty as you make them. Unfilled, each one has 107 calories. If filled with sliced strawberries (13 calories for 1/4 cup sliced) and use a fat-free whipped topping (15 calories for 2 tablespoons fat-free Cool Whip), then sprinkle with confectioner's sugar, you can make a "decadent" dessert for under 150 calories. Even if using real whipped cream (30 calories for 2 tablespoons whipped), instead of fat-free whipped topping, the calorie count only "jumps" to 150 calories. For eclairs, the recipe is exactly the same, only instead of using a spoon to form the dough on baking sheets, fill a pastry/icing bag, without the tip, with the dough. Pipe in ribbons, directly onto greased baking sheet, 1-inch wide, 3-inches long. Bake as above, at 450 F to start, then 325 F to finish, until golden. Slice eclairs horizontally, and fill with ice cream, whipped cream or cornstarch pudding. Have an awesome Mother's Day! I hope your Mother's Day is special, too! Oh! Good idea! We are out of snacks and I need to bake something. Plus, it's raining cats and dogs here, so staying home and baking sounds great. Have a great Mother's Day! It was a great way to spend a rainy afternoon. Now to think of something to do indoors, today -- we can't seem to get a break from rain this spring! Actually, I decided on making popovers which I will fill with something yummy--it's been a high calorie couple of weeks so I need to slow down a bit on my eating. Popovers sound yummy! I always think of my mom, when I think of popovers. They were a favorite of hers. I think she enjoyed them because they were so light. Do you have a popover pan, or do you use custard cups or a muffin tin? My mom always used custard cups, and hers came out so beautifully. When I've used a muffin tin, I've had a hard time getting them out in one piece. Tips? I used a muffin tin--I only have 4 custard cups. I sprayed them well but they are still baking so I'll have to wait and see how they come out! It's been a long time since I've made them. I also like how light they are--and they are really a quick throw-together food--I really should dust off this recipe more often! Lili, you might want to edit your recipe to include the eggs in with the rest of the ingredients in the ingredients list. Ha ha! Thanks, Brandy! I guess I was in a bit of a rush and didn't proof read very well! But thanks, I appreciate it! I do like to live dangerously! At least every once in a while! I used to make a ton of these, back when I was a teen in high school, for various events. Simple to make, big "wow" factor. Hadn't thought of them in years! I have never made these because this is one sweet I can resist. However, everyone else I know loves them so it would be good to make them to take out. They look pretty easy, so I think I will give them a try. Sounds like they might just be a good item for your gatherings. OMG... I think I gained 5 pounds just reading this! Seriously, I would be incapable of filling them with anything but real whipped cream... LOTS of real whipped cream... and I'd probably eat them all too! And aren't other people supposed to be preparing food for you on Mother's Day? :-) Well, in any case, hope you have a happy one! The way it works around here on Mother's Day is I gather what we'll want to eat. Sometimes that means I do some baking to get things ready. 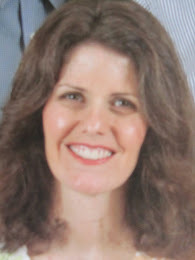 Then on Mother's Day itself, my kids and husband put it all together, AND, they do the clean-up. The baking part is the fun part. Not so much for the clean-up. Have a great weekend, Cat. Wow! Who knew (well, you did obviously...) Gotta try this! These are so easy to make, yet look impressive! Hope you give them a try! i love cream puffs. cream puffs called in germany windbeutel. it's really easy to make. A beautiful name for the cream puffs -- windbeutel. Happy Mother's Day to you, too!